Merry Christmas from everyone here at DUBC! At this time of year we ask that you keep the friends and family of Thomas Blair in your thoughts. Ted was a member of DUBC’s senior VIII in 1958. Blair, Thomas Frederick (“Ted”) P. Eng. Passed away peacefully on Saturday December 21st, 2013 in Brampton at the age of 74. He will be lovingly remembered by his sons David and Allan (Teresa); daughter Heather, grandchildren David, James, Becky (Jared), Richard; great-grandson Nicholas, many extended family and friends.Ted was predeceased by his beloved wife of 33 years, Pat, back in 1996. Educated at Portora Royal School in Enniskillen, Ireland, and Trinity College Dublin. Two people will receive the gift of sight from Ted – “Be an organ donor!” Ted’s celebration of life will occur at Andrew’s Community Funeral Centre (8190 Dixie Rd., Brampton, ON. 905-456-8190.) on Saturday January 4th, 2014 at 1:00pm Please leave a message of condolence at www.andrewscommunintyfuneralcentre.com In lieu of flowers, please make a donation in Ted’s name to Toronto Odette Prostate Research Group, or the Brampton Civic Hospital. Neptune head was in essence the curtain-raiser for DUBC’s season, aside from the sculling ladder. The club chose to focus on two events: Men’s Inter 1x, 4+ with entries in 2x as well. This proved very successful for the club, taking the top 2 places in both events, as well as dominating the top 10 of the Inter 1x, with 7 of our scullers landing top 10 positions. Following a quick trailer loading, and with the boats safely secured to the trailer, we sped back (obeying all speed limits) to civilisation and warm showers to wash off the “Blessington” in preparation for the celebration dinner. The dinner was a great success with equal amounts of old members and current members attending to celebrate the National Championship winning Novice VIII from last season. Many thanks go to Barry Crushell for hosting us once again in the Stephen’s Green Hibernian Club. Sunday morning brought many of those who attended the dinner back together for our Remembrance Sunday ceremony at the War Memorial. This was followed by the boat naming ceremony to name the two new pairs the club received from Mike Ryder and John Pearson over the summer. The boat donated by Mike Ryder was named Spirit of ’66, and John Pearson’s was named JP. The club would like to take this opportunity to once again thank both John and Mike for their generosity. The club has already made great use of the two boats with our focus on small boats, and it is clear that we will continue to do so for years to come. DUBC would also like to thank all those who came to the dinner on Saturday and to the boathouse on Sunday. Firstly on Saturday evening (9th November) the Boat Club will once again descend on the Stephen’s green club to celebrate another great season. 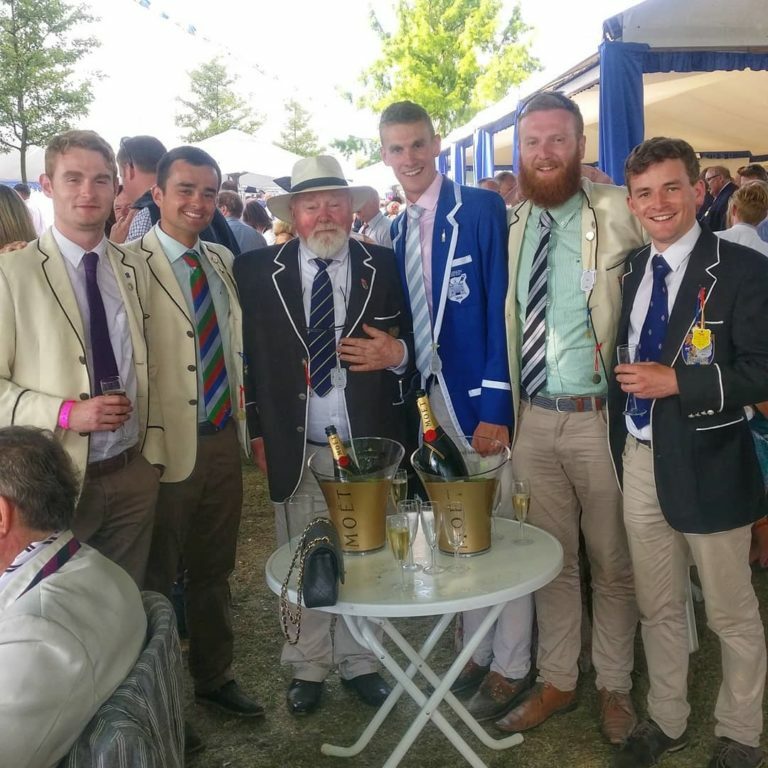 The celebration will be in honour of the Novice VIII champions of Ireland, but also the Senior IV+ and their brave exploits at Henley Royal Regatta. Download your invitation here. Then, on Sunday the 10th, we will gather in Islandbridge at the Irish National War Memorial, to celebrate Remembrance Sunday. We will be remembering not only all those who lost their lives in the Great war but particularly those who were members of DUBC. The commemoration will begin at 10:30am with the traditional two minute silence being held at 11am. Following the commemoration, there will be a boat-naming ceremony in the boat house to thank both Mike Ryder and John Pearson for their extremely generous donations of two brand new pairs over the summer. Hope to see as many of you as possible both at the Dinner on Saturday, and the Memorial Service on Sunday. And so we reach the first milestone of this college year: Reading Week. This marks the halfway point of our first term. The novices have been learning the ropes and have made excellent strides under the stewardship of our new Development Officer Charles Cunningham, joining us from Queen’s University. The large senior crew has been hard at work as well. Having met our new Head Coach Nick Dunlop (Capt. ’81) and his panel of ex-DUBC oarsmen, it wasn’t long before a program was put in place and training began in earnest. All athletes on the squad have been putting in the miles during the week in single sculls, as well as other crew boats at the weekends. This substantial waterwork has been supplemented by sessions on the ergometer as well as weights sessions, both of which we can now complete on campus thanks to the erg gallery on the 4th floor of the sports centre as well as a weights room shared with Mark Pollock. This has helped to make our training more efficient and hopefully more effective. The Dublin Sculling Ladder time trial was the first chance to show the speed and potential we have this year in DUBC, and show it we did. DUBC retained the Casey cup for the fastest 8 scullers in a club for the 4th consecutive year, beating Commercial and UCD. All 8 of these scullers finished in the top 30 of a field of over 200, while also completing the trial in under 7 minutes; albeit in favourable weather conditions. Moving forward from this, the crew recently finished a week of testing which concluded in the selection of crews for the upcoming Neptune HOR in Blessington. Jamie Pounch F.M. McCormick Sch. And so with the madness of Freshers’ week over, it came time to welcome many of the new members the Boat Club accumulated throughout the week. There was a minor speed-bump in the plan for the open day when the coach that had been organised to cart the eager new faces out along the Quays as far as Islandbridge, failed to show up, leaving us with no other option than to shepherd several dozen people onto public buses. That said it was only minor and when they eventually made it out, they were greeted by an apologetic and enthusiastic Luke Acheson, who welcomed them into the club and laid out the plans for the day. Captain 13-14 Luke Acheson addresses the new recruits at the entrance to the Boathouse. Several “stations” were provided for the new crop of novices to introduce them to all aspects of the sport. From a chance to learn the basic technique in our tank, to a video presentation from Development Officer Colm Dowling. There was also an introduction to the ergometers as well as a breathtaking display of single sculling from Hon. Secretary Alex McElroy. Unfortunately due to the initial delay we were forced outside to accommodate the ladies club who were also hosting their Open Day the same day, but the glorious weather meant high spirits all around as new members got to meet their future teammates and learn more about what makes rowing and DUBC so special. All in all, a great success and a great start to the year, hopefully an omen of good things to come. We also look forward to seeing our new oarsmen thumping up and down the Liffey at Islandbridge in the near future! All current members are reminded that the boathouse is closed and will reopen on Wednesday, August 14th. No access to the BH, boats, and changing facilities is permitted until then. A great achievement for DUBC with six of our senior/inter athletes being selected to row for Ireland at the Home Internationals Regatta in Nottingham, July 27th. The senior four were back in their preferred coxed craft and faced a strong English crew from Thames RC. As with their quarter final at Henley Royal, the four took an early lead and commanded the race for 1500m. Unfortunately (as with HRR!) the four didn’t have the final sprint to hold off England and finished second by a canvas. Video of the finish. The men’s pair was made up of Home International veterans, Luke Acheson & John James Magan. Luke and John were also selected in 2011. Similar to the 4+, the pair were missing that little edge in the dying strokes and lost to England by a canvas. Video. As chance would have it, the other two selected athletes to make up the 8+ were none other than Lizzy members Brendan Smyth (Captain ’93) and Stuart King (Captain ’02). A full eight of DUBC oarsmen took to the water! 2nd place was the theme of the day – England took an early lead and although Ireland pushed and pushed, it was never enough to catch their rivals. Video. Over thirty of DUBC’s finest Novice, Intermediate & Senior athletes travelled to Cork for the three day Irish Rowing Championships, July 19th-21st. For those who aren’t familiar, the course is located at the National Rowing Centre a few kilometres west of Cork City. The senior four didn’t make a smooth transition from Henley’s coxed four to the coxless craft for the championships and they finished fifth. The intermediate eight broke into two fours on Friday. Both made the final with the ‘A’ four finishing third and the ‘B’ four finishing sixth. The results showed promise for the intermediate 8 the following day as we were the only university to have two fours make the final. The inter 8 led the field to 1000m but were then out gunned by more experienced crews and finished fourth. The NUIG crew that won were in their third year trying for inter 8s, it was a first for four of the DUBC crew. The success story from the weekend was a win in the Men’s Novice 8+! After a mixed bag of wins & losses all year, they won the pot in style – clear water over UCD and 4+ lengths over the rest of the field. Seven of these men picked up the sport just 10 months prior and showed true determination to dedicate themselves so willingly and passionately to a sport they never knew of before joining Trinity. Congratulations to crew, cox and coaches. Watch out for these men in the seasons to come! The almost-success-story was the Men’s Novice Quad. Having narrowly lost to UCD at Neptune Regatta, Trinity Regatta, Dublin Metroplitan Regatta & Cork Regatta, they have had a thorn in their side for the last three months. In the final, they finished with 4+ lengths of clear water over UCD and every other quad but a new face appeared on the day – Shandon BC. Two of their line up won the very competitive Men’s Junior Quad and they had a little extra skill that the DUBC men lacked – with 250m to go and both crews being dead level, Shandon had the experience to kick and ended DUBC’s hopes of a medal. A small moral victory for turning the table on the blue & yellow crew from across the river. A “Men’s Beginner Quad” had been added to the 2014 Championships and this has DUBC written all over it! DUBC had entries in the men’s novice sculls, inter sculls, inter pair and senior pair but no finalists. Some first years bravely entered the Inter pair, the experience of which will stand to them as they progress with DUBC. A successful Championships for some with a definite prospect for a very large and very competitive intermediate group in 2014. Thank you to all our members for putting in so much time all year round and for representing Trinity to the highest standards. DUBC’s Senior 4+ secured pre-qualifying with their result from Marlow Regatta. The five men anxiously awaited the draw and there were mixed feelings about drawing the seeded crew, University of Virginia, USA. Having no idea what to expect, the DUBC men queued up behind the island on Wednesday morning to face the crew in bright orange. (Coach Gerry Cantan did send a video of Virginia winning the USA Collegiate Varsity 8s in 2012 but kept that from the crew till after). The red flag went down and so began the side by side battle over 2112 metres. DUBC held off Virginia to the barrier but then the seeded crew showed their class and moved through DUBC, reaching Fawley first. Going past the athlete enclosure, the two crews were level. In the dying 40 strokes, the Trinity men kept their cool and pulled away from Virginia who’s technique began to flutter. A win for Trinity by 3/4L! On Thursday, DUBC faced another seeded crew, Isis boat Club. A win would see them through to the semi final on Saturday with a rest day on Friday. DUBC nudged their way to a small lead through the barrier and again through Fawley. Regatta radio had spectators on the edge of their seats. It sounded like the Trinity crew were in control of the race but it was not to be their day. Passing the Stewards, the effort of holding off Isis for so long was felt and the Oxford crew slipped through DUBC to win by 1L. Three of the Isis crew raced in the Isis 8+ as part of the ‘Reserve’ University Boat Race so it never going to be an easy race. Isis then went onto make the final and finished second to Imperial College London. Congratulations & commiserations to the five Trinity men and coach – Will Hurley (bow & admiral), Paul Flaherty (2), Dillon Rooney (3), Matt Brophy (stk & vice captain), Conor Traynor (cox), Gerry Cantan (coach). A big thank you to all members who show their support year on year at Henley Royal Regatta. Two crews will be competing in 2014, you heard it here first! DUBC win the IM3 8+ at Marlow Regatta! The Novice Men continued their winning streak with a win in the ‘Intermediate Three’ 8s – the UK’s category for beginners. This first time an Irish crew has won at the Novice 8 level (we think!). Well rowed Trinity! The Senior Men finished 5th in the MS 4+, the third university crew. The Inter Men focused on two 4s and finished second in the IM1 4+. A special thank you to Mike Ryder who kindly provided refreshments to all Trinity crews & members. Due to adverse weather, the Irish University Championships were moved from Cork in April to Blessington Lake in May. More winds on the rescheduled day (!) meant that only the 8s could be run. The Novice 8 didn’t get a lot of paddling done over the exam period but this was no excuse as every college was in the same situation. The 8 nudged their way to length lead coming into the final 500, almost letting it slip in the last 250 as UCD made a final move and DUBC were nearly caught napping! Irish Champions none the less! The Senior and Intermediate 8s both finished third, behind UCD and NUIG. At Dublin Metropolitan, the Novice 8 walked away as DUBC’d only winning crew. DUBC had crews in the Men’s Senior 2-, Inter 2-, Inter 1x, Inter 4, Senior 4, Novice 4x, Novice 1x, Novice 4, & Inter 8 but none managed to take to take home the silverware. The Queen’s Boat race has grown into a small festival of rowing and is no longer just the Trinity v Queens day it once was. Queens have grown it into a full day of racing for ‘Freshers’, Seniors and Schoolboy/girl crews. The Seniors opted to stay at home and the Novice Men sent two fresher/first year crews. UL were scheduled to race but on the morning they announced that they would not be travelling, much to the disappointment of DUBC. The DUBC B crew but up a fight against Queens A but it was too much to ask from the scratch crew, most having switched to a quad scull after the Dublin Head of the River! In the final, Queens once again took a length within the first 20 strokes but the A crew kept their nerves and slowly worked their way back level by 500. Coming through the final bridge the crews were level but a massive 60 strokes saw DUBC win with clear water! Three wins in a row for the Novice 8 – well done gentlemen! While the results didn’t go DUBC’s way, as an event the Regatta was a great success. With over 420 crews entered, it was the biggest Trinity Regatta the Club has seen in some time. For the first time in many years racing had to be spread over two days to accommodate entries. Even with racing on the Friday and Saturday, we were still struggling to accommodate the barrage of entries. Innovation was required and Andrew Coleman organised a time trial for all single scullers with the fastest four in each category taking semi final places. The Regatta Luncheon and Tea were also great successes, allowing oarsmen from across generations to catch up and reminisce. Many thanks to all Old Members who came down to support or help out. And a special thanks to Regatta Chairwoman Bridget Collins and Regatta Secretary Cormac Shine for running the show. The Head of the River season saw DUBC pick up pennant after pennant at various events – the long winter’s training had paid off. We travelled to the Head of the Shannon, hosted by Carrick RC, Portora’s Erne Head of the River, and the Dublin Head of the River. St. Michael’s HOR was cancelled due to adverse weather. At Carrick, entries were in the Men’s Senior, Inter and Novice 8s. DUBC won all three titles albeit no other Senior 8s were entered. Interestingly, the Inter 8 clocked a faster time than the seniors which was blamed on ‘the afternoon’s head breeze picking up for the senior crew’ but there were plenty of very confident Inters about the boathouse the following week! There were entries and wins in quads, doubles, and sculls, giving purpose to our small boat ethic. The beginner men beat the second year novice crew giving them a great buzz going home. Erne saw a massive entry of 52 eights across all categories. The Senior crew, having spent most of the winter in small boats, finished 4th and were happy with the potential for speed going forward. The Intermediates finished joint first with UCD in a time of 20:08 and, with NUIG clocking 20:09, eyebrows were raised at the potential for a neck and neck fight for Intermediate 8s in July. The Beginner 8 finished second in Novice 8s to UCD’s Beginner 8 by 1 second, raising the prospectus for a very close Colours race! The Queen’s and NUIG Novice 8s were 12 and 26 seconds behind, respectively. 6-in-a-row for UCD was the unfortunate theme for the Gannon Cup. The UCD crew dominated the race from early on and finished with clear water. UCD has been attracting junior oarsmen for the last number of years and are now benefiting. DUBC must move with the times in attracting quality Junior oarsmen in order to compete. The DUBC Gannon crew contained four oarsmen who were novice/new to sport three years ago and learned their trade in college. The UCD crew contained a full ex-Junior line up. Not an excuse for defeat as we must move with the rising standards. In the Dan Quinn Shield, UCD took off with an early lead and sat on the DUBC crew throughout the majority of the course. With 500m to go, the coxing wire snapped, the tiller locked right, and the DUBC crew went full force into the embankment. In the strokes just prior, the crew pulled back 1/4 length in three strokes and looked solid for a sprint finish. Unfortunately there was nothing the cox could do as it was all in the flash of two strokes. Both race videos are on youtube. Three Novice 8s and a Novice Quad competed at the Dublin Head. The results were 1st, 3rd, and 4th for the 8s and the quad was a stand alone entry. The Novice 8 beat UCD and Queens, a small redemption after the Colours loss. Due to a clash with Trinity Ball, a decision was made not to participate in Novice 8s. The novice group were entered in sculls with the inters & seniors travelling to the lake. The top first year four were entered as Inter and drew Portora in the first round at 9am. The four, with three people post ball, finished just one length behind Portora. No other inter four came as close. The second four, entered as novice, finished second to a more experienced crew from Belfast RC. The first year Quad finished two lengths off UCD’s second year quad, getting through a tough heat and semi final on the way. A different approach to the Trinity Ball will be needed next year and racing will be put first. The Senior 8 ended in a similar fashion to Colours with a defeat to UCD. The Senior 4 was won by UCD ‘A’ over Trinity after Trinity knocked out UCD ‘B’ in the semi. The Intermediate 8 was knocked out in the semi by UCD. Our ‘A’ Intermediate 4 was knocked out by UCD and the ‘B’ Inter 4 was disqualified at the finish line after comfortably beating Commercial’s Inter 4 but having clipped a buoy along the way. In the novice 8, UCD knocked out Trinity ‘A’ and Trinity ‘B’, having beaten a Neptune Junior 8 in the semi, faced UCD ‘A’ in the final. The ‘B’ first year crew knew they had a mountain to pass in beating a full second year crew but they put themselves on the line from the first stroke. They were half a length down half way going past the concrete wall when UCD pulled away. With UCD having the north and final bend, they pushed again and stretched to clear water. The first years were severely disappointed which shows the high standards they give themselves. Novice Quads produced some of the most exciting racing all weekend. In the semi, DUBC B beat DUBC A. The two crews were neck and neck all the way down but ‘B’ slipped away on the home straight after ‘A’ crabbed and lost speed. The B crew, full beginner quad, faced a very experienced Neptune junior quad in the final. The crews were trading punches the whole way down the course but the juniors showed an extra bit of class and slipped away going past Garda Boat Club to win by 3/4 length. The DUBC crew was newly formed and had limited sculling time so with a small bit of work they’ll be a fighting force for Metro, Uni Champs and beyond. Twenty of the beginner’s group had their first camp experience in Blessington lake. The first session consisted of 16k with the last 3k ‘all crews square blades’. They survived. The mileage totted up in the first two days but the winds picked up and the crews were forced onto a very unforgiving course. In the evenings, they digested each others ‘specialties’ while analyzing videos from the day and comparing blisters for the first time. They joked about the few people napping between sessions on the second day but, by the end, all twenty were “power napping”. They were delighted to be back to the sheltered trinity boathouse and the quality of their paddling is up enormously. On the 4th of January DUBC embarked on the annual training camp at the Centre of High Performance Rowing in Seville. It was 8 days of intensive training with temperature of 20 degrees where most of the athletes completed 200km on the water. The regular day had 3 sessions; a morning of races, which ranged from rate 20 2000m pieces to free rate head races, a core workout before lunch and a long paddle up through the town in the afternoon. Gerry was very pleased with the performance of the athletes and the general attitude towards the training camp. Meanwhile the others who couldn’t go to the training camp in Seville and the Second Year Novices were at the sculling camp in Blessington for five days with 2 sessions on the water every day.The main aim of the camp was to improve confidence, boatsmanship and overall technique within the second year novice squad. With DUBC having a senior and intermediate squad this year the second year novices have struggled to get time on the water in sculls, so having all boats available allowed us to get, lots of mileage under our belts as we enter 2013. Massive improvements were made by all the athletes, which was accelerated by the fact that the lake was unusually claim and dry, although very cold and icy. Many thanks must go to Micheal Ryder and Peter Wolfe whose combined expertise were critical to the success of the camp, and will most certainly stand to us as we enter the new season.